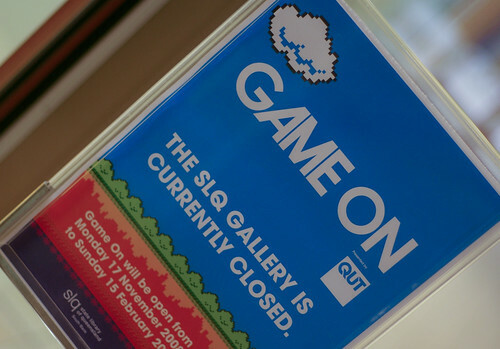 A month from now sees the launch of the Barbican’s fantastic “Game On” exhibition at the State Library of Queensland, and for the opening I’ve been asked to put together some “traditional” and projection-mapped visuals. As the exhibition covers a wide range of gaming genres, the aesthetic is hugely varied, so rather than keep the gig all to myself I’d like to open this project up to the CDM community. The event will feature VJ-mixed DVDs projecting on screens shaped like the “8-bit Cloud” in the above photo, and projection mapping on the State Library’s excitingly shaped “Knowledge Walk” architecture. I have a budget for content creation and remixing, and would love to have Australian and international visualists lending their photons to this event, which is both held in a great-looking venue and features eminently geek-friendly content. If you’d like to get involved, nominate someone else, or suggest some great raw material for inclusion (apart from Analog Recycling’s 8-Bit Loops, which of course will be making a tongue-in-cheek appearance) email gameon@createdigitalmedia.net (or of course use our handy contact page).